All anyone can talk about these days is Zelda: Breath Of The Wild, and with good reason. The game is a tremendous accomplishment, both an ambitious reinvention of one of gaming’s most revered series and a thumb in the eye of open-world games everywhere. Today Nintendo itself got in on the action. On its YouTube page, the publisher just launched a three-part video series about the making of Breath Of The Wild, featuring all kinds of never-before-seen developer interviews and production materials. All together, it’s a fascinating look into the complex nature of the game’s reactive world and the task these creators took on when they decided it was time to rethink Zelda from the ground up. The first video mostly addresses the challenge of breaking the series down and building it back up from its essential parts. Beyond a desire to recapture the original NES game’s sense of adventure and freedom, the team decided early on to focus on the way objects in the world interacted with Link and each other—wood should burn, fire should spread, moving water should carry floating objects, metal should conduct electricity. As the video shows, the team actually created a 2-D prototype based on the original Zelda to demonstrate these concepts before implementing them into the full game. The final video is all about the game’s characters and story. This one might just be the most entertaining, as it shows off plenty of weird concept art that didn’t make the cut, like Link riding on a motorcycle or playing guitar. The developers also go into great detail about what it took to reenvision Princess Zelda this time out, stressing that they wanted her to showcase more emotional range, and how they went about telling a story when they had no control over the order or timing in which players would engage with it. 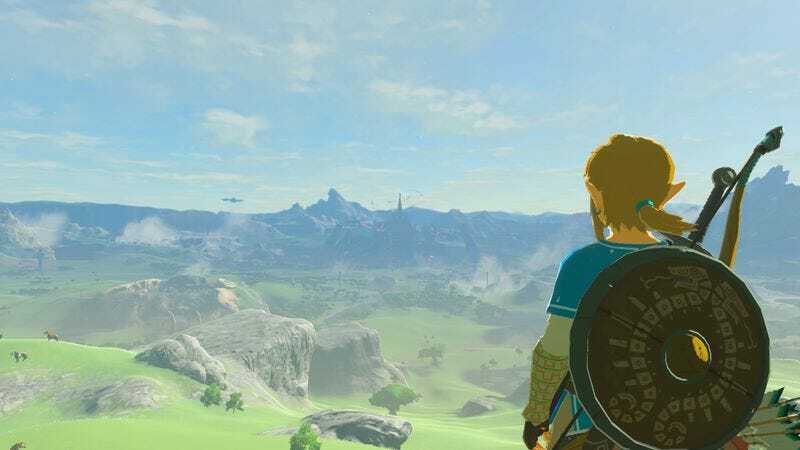 And if you’re looking for an even deeper look into all of these subjects, the Game Developers Conference has published the 90-minute talk that three of Breath Of The Wild’s lead developers gave during the show. It covers much of the same ground, but since it’s intended for industry professionals, it gets a little bit more clinical. Even without the real depth of knowledge to fully follow along, it’s a fascinating exploration of the philosophy behind this project.